Singing is the first approach to music making for children. Children should sing every day, and singing should form the basis of every general music class, whatever other activities are included. One of my goals for teaching elementary music classes (K-5 or even K-6 is elementary school level in my opinion, despite the local truncation of elementary school after 4th grade) was to introduce a new song every class. In practice this was not strictly possible – often I taught folk songs and ballads with many verses, which would take more than one class for students to learn, and when performances loomed classes would often focus on polishing what we already knew – but in general it is a good policy which I was able to follow most of the time, and resulted in my students knowing hundreds of songs from memory by the time they left my program. When I first began developing the music curriculum I taught at elementary and K-8 schools through the nineties until 2007, I began collecting songs suitable for children at graduated levels of ability, that described or reflected on a wide range of human activity and concerns, and that ultimately could become a “song literature” for the school. In this way at the schools where I taught, singing became not only an avenue for students to develop musical skills and to learn about the world and the musical tradition itself, but also became a means for developing community. Students sang together regularly outside of music class – whether in organized assemblies or spontaneously even across grade levels, and all students held collectively a body of songs that was shared by the entire school community. In this way, music, and singing became a vital part of school culture. The elementary school song literature comprised mostly English language folk songs and canons from the United States, Canada, the British Isles, and Australia, augmented by songs in other languages including Latin, French, German, Italian, Spanish, Russian, and Hebrew, as well as African and Asian languages (or songs with texts translated to English from these languages). Occasionally I would teach contemporary songs but for the most part the emphasis was on traditional literature. Our musical tradition is some thousand years old and it is my feeling that if students do not become acquainted with this tradition when they are children, when will they? It is a vast tradition, unrivaled by any other art form, and it is the responsibility of the music teacher to give his or her students the means to appreciate and access this tradition so that they can incorporate it into their own lives according to their own needs and inclinations. From a technical and musical standpoint, the elementary school song literature provided a rich repertoire of training material which gave students the opportunity to develop their musical skills to a high degree before they hit puberty. It included dozens of canons from simple rounds to catches of considerable complexity requiring an extended vocal range, providing young singers many experiences singing harmony and opportunities to develop musical independence. Each year I would find new songs to add to this curriculum and others which I had taught might drop away for a year or two, but there were some songs that I felt it was important for every student who participated in my program to learn, and most of these I would teach or review every year. Sumer Is Icumin In is one of these songs. 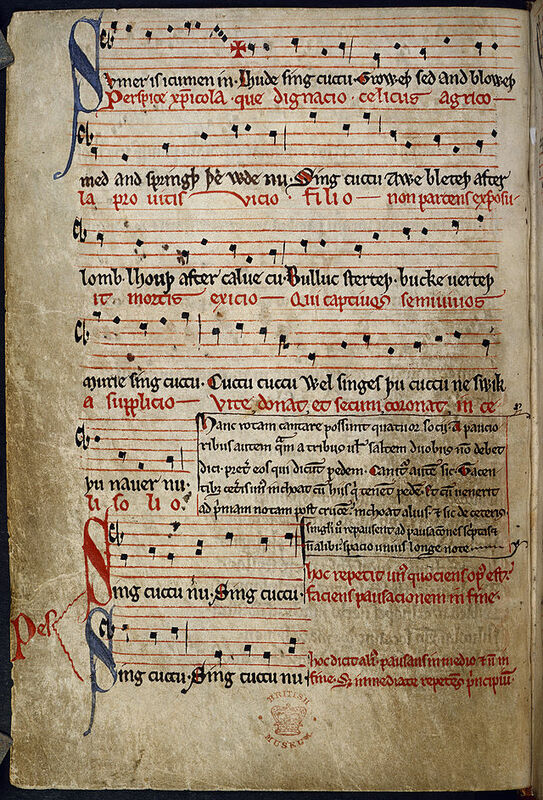 It is a Medieval rota – the ancestor of the musical form that would be known later as a round – and is the oldest known example of six-part polyphony, and also one of the oldest surviving example of counterpoint. The manuscript (above) in which it is preserved was copied in the early 1260s. The text, which is in Middle English (think Chaucer, who lived roughly a century later), is a celebration of the beginning of Summer. (A discussion of the text – some of which is obscure – can be found here.) I would invariably teach this to my students at the end of the school year, often featuring it as a part of Spring performances. Sumer Is Icumen In consists of a four-part canon sung over a two-part burden (or pes, as it is called in the original score). As with many canons, there are a variety of ways in which it can be performed. A transcription in modern notation, transposed down to D (more suitable for young voices) can be found here. This is a recording I made with 4th, 5th, and 6th grade students at Linden Corner School in Nashville in 2005. Linden Corner was (and is) a small school with one class per grade level, and the (unauditioned) choir heard here consisted of every student in those grades, who had been working with me for about a year when I made this recording. All the instruments on the recording are played by students as well. The entire choir sings the song in unison twice: first over a simple ostinato on cello, then over the burden played in two parts by recorders and strings. The burden continues through the rest of the arrangement, and the choir then sings the canon in two parts, and finally in four. Years later when I was the choir director at Nashville School of the Arts, I brought Sumer Is Icumen In to the program’s Early Music Consort, a female choir that also included a small string ensemble and studied mostly Medieval and Renaissance literature. Here the arrangement begins with the choir singing the burden and the strings playing the canon in two parts, followed by a two part presentation of the canon by choir and strings, and finally the choir performs the canon in four parts over a pizzicato burden by the strings, who revert back to arco for the ending. I was struck by how different my experience was teaching the canon to high schoolers than to elementary school students. Both groups showed equal enthusiasm for the piece, exhibiting delight in the intricacies of the counterpoint, the rising and falling melodic lines, and in the challenge of maintaining independence when singing in canon. But the high schoolers – most of whom had little or no musical training before they entered my program in ninth grade – had much more difficulty in learning it, and the process took a lot longer. Having taught the same piece to students in both elementary and high school, the experience was yet another (albeit unscientific) confirmation of my impression that while more mature students (with training) are capable of mastering music of greater complexity and difficulty, they do not assimilate material anywhere near as readily as younger students. In general, older students require many more repetitions (i.e. more practice time) to master the music under study – and therefore, they will learn less material given the same amount of class or rehearsal time. This is especially true if the teacher must also impart fundamentals that should have been learned when the students were younger. Which is to say: it is absolutely crucial that children receive musical training when they are in elementary school – when the “developmental window” is thrown wide open for them – the time in their lives when they are able to do the most with it to build solid skills and an inclination to include music as part of their lives when they are older, even though this time of life may not be the most convenient for their families, their schools, their school districts, or the standardized testing schedule. Above are only a couple of possibilities for student performances of Sumer Is Icumen In. The song is often found in anthologies of early English music or collections of canons published the last fifty years or so, but I am not aware that many elementary school music teachers bring it to their students unfortunately (at least I have never met one who admitted that they did). It’s received some attention from composers and been utilized in music for film and television as well over the years. Notably, in English composer Benjamin Britten’s massive choral Spring Symphony, Op. 44 (for three soloists, mixed choir, boys’ choir, and orchestra), the boys’ choir sings Sumer Is Icumen In at the climax of the fourth movement. In this 1961 recording, directed by Britten himself, you can hear the boys’ choir enter with Sumer Is Icumen In at 41.29. Less momentous but also of interest, Peter Schickele’s P.D.Q. Bach included a rather silly version of the song Summer Is A Cumin Seed in his oratorio The Seasonings. You can hear it on this recording at 8:38. Thank you to my son for giving me the idea for this post. We were sitting in the car at a stop light last week and he started singing Sumer Is Icumin In spontaneously – I guess just in response to the balmy weather and time of year. I must have taught it to him more than a dozen years ago, but it’s one of those songs that stays with you. An abridgment of this article appeared in the March 2017 issue of Choral Director magazine. By walterbitner in Choral, Early Music, Medieval, Music Education, Pedagogy, Philosophy on June 3, 2015 . Do you have a list of the songs you taught? I’d like to cover more repertoire with my K -5 music students. I see them for 50 min once a week. Thank you! I do not have a list in electronic format – yet. I have considered publishing a collection for a long time and I have several handwritten lists from working drafts I made years ago, but I haven’t had time to order them the way I would like. Follow my blog for updates on this and other projects… I only left teaching five months ago and am just beginning to write about all this. Thank you for your interest! One of my favorite rounds on recorder so, etc. Thank you for sharing this song! As a high school chorus teacher, I’m very intrigued by the differences you observed in teaching this piece to elementary students and high school students. I hadn’t thought about it before! Loved the article. I am a middle school orchestra teacher and I am starting to teach more folk songs by ear to the students. Do you have a list of the collection of folk songs you used to teach the students in your program? I would love to be able to use that list as a starting point. Thanks again. Hi Toby – thank you. I am working on a list, in fact – a book. I will continue to write about some of these songs on Off The Podium, and of course will post about it once this project is ready. In the meantime I encourage you to roll up your sleeves and find the songs that resonate with you! Make them your own, and build your own curriculum and favorites.